When Miriam of Israeli Kitchen asked me if I’d like to do a guest post on her wonderful blog I was truly honored. Miriam has lived in Israel for 33 years and is full of knowledge about Israeli and kosher cuisine. She makes her own dandelion beer and fruit wine, bread and flavored oils. Miriam loves markets as much as I do and warmly welcomed me into the world of Anglo food bloggers in Israel. We’d been emailing for almost a year before we finally had the chance to meet in person at a dinner with cookbook author Gil Marks, and were really able to spend some quality time together at the Sommelier Wine Expo in Tel Aviv. She’s even coming to visit in Be’er Sheva (as soon as the trains are back up and running!) to see what our shuk has to offer. I discovered this Cinnamon Bun cake during a brief stint photographing contest finalists for The Joy of Kosher website. I wasn’t entirely sure how it would come out. 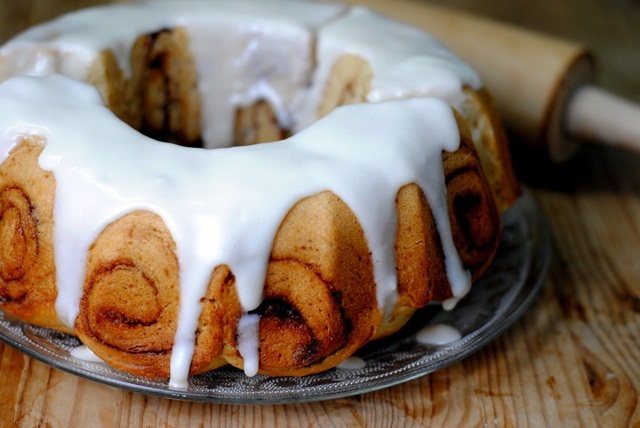 I mean, who doesn’t love a good cinnamon bun, but does it really need to be turned into a cake? Well, let me allow the fact that it was gone in two days flat speak for itself. And there’s just two of us. We ate it for dessert, and for breakfast, and as an afternoon snack. I think it makes a perfect holiday breakfast, something pretty and festive to place on the table. What a gorgeous cake! Heading over to check out the recipe now..
Oh, this is right up my alley. Gorgeous and tempting. I have to see this. What a perfectly wonderful creation!! Awesome looking cake, buzzing now and popping over for the details-yum! Went over to check out the recipe … will give it a try during my days off! 🙂 Yeah! I hope you enjoy! Let me know how it turns out! Oh my, my heart almost stop beating! this is super gorgeous! have to check out your recipe. I have to say, those cinnamon swirls on the side are perfect and make for one of the prettiest bundt cakes I’ve ever seen. Wow. I wasn’t sure whether something like a cinnamon bun needed to be made into a cake, but if it was gone in two days, apparently the answer is yes. Headed over now to check out the recipe and a new blogger! Haha my thoughts exactly! We devoured it. Great, simply great! I want to try the cinnamon rolls, but this looks awesome! Thank you Giulia! The taste is like a cinnamon bun but the presentation is what’s special. Aw thanks Sandra you are too sweet! Thank you for having me Miriam! I hope you like it. Let me know how it comes out! The cake is indeed very pretty! This is absolutely beautiful Katherine! Now I know I definitely need to get myself a bundt pan! Aw thanks Peggy! I just got a bunt pan a few months ago and absolutely love it. Oh my… gorgeous cake Katherine! I always like bundt cake with icing dropping down… so pretty! I will hop over to Miriam’s site. Thank you Nami! Me too 🙂 I hope you’re enjoying your trip! What a fun recipe! Really terrific idea. And I like the rolling pin in the background of the picture! Oh my goodness this is spectacular. Off to see it over at Miriam’s. Thanks Kim! I know you’ll love Miriam’s blog. 😀 so glad you like! Thank for stopping by! How tempting is that. Just gorgeous! Love this! i love cinnamon anything. this looks fabulous !! Me too! It brings such a wonderful labor to sweet and savory dishes alike!